Section on General Internal Medicine, Wake Forest University School of Medicine, 1 Medical Center Boulevard, Winston-Salem, NC 27157, USA. E-mail address:jluthra@wakehealth.edu (A.K. Luthra). Received: December 12, 2016; Accepted: March 2, 2017; Published online: March 31, 2017. Endoscopic ultrasound is a rapidly evolving technology with an expanding list of diagnostic and therapeutic capabilities. Innovative uses of endoscopic ultrasound in pancreatic malignancy may serve to improve survivability with earlier detection and groundbreaking interventions. This article aims to review these novel techniques. Endoscopic ultrasound (EUS) has evolved exponentially over the last 30 years from a superior imaging modality of the pancreas and other abdominal organs to a technology that encompass a multitude of clinical applications within and beyond the gastrointestinal (GI) tract, revolutionizing the field of gastroenterology.1,2 Its earlier diagnostic limitations have now heralded a new era of superb and near microscopic level of imaging, thus being able to distinguish malignant and nonmalignant pancreatic lesions.3–6 The advent of accessories and needles used in conjunction with EUS has now allowed visualization of pancreatic lesions and moreover, endoscopic therapy, allowing minimally invasive alternatives to surgical interventions involving pancreatic lesions. In this article, we will review the wide array of current innovative techniques for EUS in the diagnosis and intervention of pancreatic diseases. As CEH-EUS exhibits superior visualization of detecting small lesions compared to traditional EUS, it may assist in pinpointing an appropriate target to increase tissue yield for EUS-FNA.20,21 Sugimoto et al22 reported that CEH-EUS-guided FNA was significantly superior to conventional EUS-FNA in obtaining an adequate sample on a single needle pass (60% compared to 25%; P = 0.027). This was attributable to improved visualization of SPL such that samples obtained via CEH-EUS-guided FNA were obtained from areas without fibrosis and necrosis.22 Although exceedingly rare, reports of tumor seeding following EUS-FNA with multiple needles passes have been reported; thus, CEH-EUS-guided FNA may further diminish this risk by minimizing the number of passes. Unfortunately despite advances in needle design and increased endosonographer experience, EUS-FNA yields false-negative results in 20%–40% of pancreatic malignancy cases deemed technically challenging or with concomitant chronic pancreatitis.13,23 The development of EUS elastography (EUS-E) aims to differentiate benign from malignant solid pancreatic masses without the need for biopsy.6,11,13 EUS-E works by applying a compressive force to a mass during real-time EUS to assess the relative stiffness of a lesion compared to the adjacent normal tissue, with tumors or inflammatory lesions appearing less compressible.3,6,11,13,24 The degree of tissue strain from compression produces a color-coded elastography image that is then superimposed on conventional B-mode imaging, such that red reflects soft tissue, blue represents hard tissue, and tissue with intermediate stiffness appears yellow/green (Fig. 1). Given the subjectivity of this qualitative EUS-E, second-generation EUS-E technology analyzes lesions using a strain ratio, which is the ratio of tissue elasticity to neighboring soft tissue.3,6,11,13,25 Iglesias-Garcia et al26 demonstrated a 100% sensitivity and 93% specificity of quantitative EUS-E in 86 consecutive patients undergoing EUS evaluation for solid pancreatic masses for differentiating malignancies from benign pancreatic lesions.13,26 This data was replicated by Opačić et al27 in a prospective study involving 105 patients with pancreatic masses and 44 controls, with a sensitivity of 98% using the strain ratio. There are however, conflicting results from other studies leading to several high-quality meta-analyses. Pei et al28 reviewed 13 studies for a total of 1,042 patients and found a pooled sensitivity of 95% with a sensitivity of 69%, while Li et al29 reported a pooled sensitivity and specificity of 92% and 68%, respectively, in 781 cases.11,13 This data suggests EUS-E is a valuable adjunct to conventional EUS, but is not currently a reliable alternative to obtaining pancreatic tissue samples. Rather, EUS-E may help support a negative cytology by EUS-FNA. There may be an additive role of combining EUS-FNA with EUS-E. A promising prospective study by Kongkam et al25 in 38 patients with solitary pancreatic lesions found a sensitivity of 90% vs 95.2% and NPV of 80% vs 83.3% in EUS-FNA alone compared with cytology in combination with elastography strain ratio. Distinguishing malignant from benign biliary strictures remains a common diagnostic challenge despite the advent of improved computed tomography (CT), magnetic resonance, and endoscopic imaging. Despite use of brush cytology to aid in endoscopic diagnosis, sensitivity remains less than ideal, often not exceeding 70%.33,39 Meining et al40 reported one of the first studies evaluating pCLE in the evaluation of pancreatobiliary duct strictures of indeterminate etiology.33,41 In their study of 14 patients, pCLE exhibited an overall accuracy of 86% (compared to histopathology’s diagnostic accuracy of 79%), based on patterns such as: large clumps of decreased fluorescent dye uptake, saccular vessels, and the loss of a reticular pattern of epithelium.33,40 Sensitivity of histopathology alone was 50%, relative to 83% when using pCLE.33,40 Kahaleh et al39 also showed pCLE diagnoses aligned with that based on cytology or histopathology with a Kappa coefficient of 0.8 (P ≤ 0.0001) in their evaluation in 18 patients. An extensive literature review by Almadi and Neumann41 found CLE in combination with endoscopic retrograde cholangiopancreatography (ERCP) for the assessment of indeterminate ductal strictures increased the sensitivity to 98% relative to 45% with ERCP alone, but resulted in a lower specificity (67% vs 100%). Fugazza et al34 recently performed a meta-analysis of 8 available studies on the evaluation of biliary strictures with pCLE to find a pooled sensitivity of 90% (95% confidence interval [CI] = 0.86–0.94) and specificity of 72% (95% CI = 0.65–0.79). This data suggests that pCLE may have aid in improving earlier detection of pancreatobiliary malignancies and influencing appropriate management. A smaller, 25 G core-biopsy needle (PC25, EchoTip ProCore; Cook Medical) was subsequently developed. A retrospective review of 50 patients undergoing EUS-FNB for SPL revealed cytological sensitivity of 83% and histologic diagnostic sensitivity of 63% from a single needle pass, which increased to 96% and 86%, respectively, with additional needle passes.45 This data is similar to 25 G EUS-FNA needles. Iwashita et al45 also found the maneuverability of the 25 G needle for accessing the pancreatic masses in diverse sites of pancreas. Recently, however, a new fork-tip needle, Shark Core® (SC; Medtronic Corp., Boston, MA, USA), has been developed to improve core tissue yield with EUS with a multifaceted bevel and differing lengths of its two sharp points.57,58 Adler et al57 performed a retrospective pilot study in 15 patients undergoing EUS-FNA as well as EUS-SC biopsy of SPL or peripancreatic adenopathy. Notable findings include the need for less needle passes with the SC needle (1.5 for adequacy vs 3.0 for EUS-FNA, P < 0.001).57 Additionally, the SC needle attained tissue core samples in 82% cases, relative to no tissue cores with EUS-FNA (P = 0.03).57 A larger case-control study by Kandel et al58 also set to compare the ability of the SC needle to increase histologic sampling and reduce needle pass rates relative to established EUS-FNA. EUS-FNB with the SC needle required a median of two passes to acquire adequate tissue, compared with a median of four passes with FNA (P = 0.01).58 Core tissue samples were obtained in 59% of FNA cases, relative to 95% of the FNB arm (P = 0.01) in lesions of all sites.58 Neither study reported adverse events related to EUS-FNB with this novel core biopsy needle.57,58 Although larger prospective studies are needed, the SC needle may allow increased core tissue yield while requiring fewer passes as opposed to standard EUS-FNA. More recently, a large retrospective review sought to assess the safety and technical feasibility of fiducial placement via EUS guidance.64 Of 514 patients undergoing EUS fiducial placement of various sites, 188 had undergone fiducial placement for pancreatic cancer. Technical success was achieved in 99.5%, with interfering blood vessels preventing marker placement in one patient. Complications remained rare at 1.3% and were minor, primarily consisting of bleeding at site that quickly resolved.64 This data may lead to more widespread use of this technique, which allows further accessibility to pancreatic tumors. EUS-guided fine-needle injection (FNI) has emerged as novel technique to treat pancreatic adenocarcinoma. This procedure involves injection under EUS guidance of anti-tumor agents directly into the pancreatic tumor.4,6,13,65,66 The theoretical advantage of EUS-FNI is direct delivery of high-concentration agents to the lesion of interest along with minimization of adverse effects associated with systemic chemotherapy. Various agents have been utilized in clinical trials. The latest data suggest EUS-RFA may represent an innovative method of treating pancreatic cancer while also providing a survival advantage. Kallis et al82 discovered significant survival benefit in 23 patients who underwent Habib RFA with SEMS compared with 46 cases of SEMS only (226 days vs 124 days, respectively; P = 0.010).82 Hu et al83 performed a multicenter randomized control trial (RCT) in 63 patients with advanced cholangiocarcinoma. Thirty-two patients received RFA with SEMS while the remaining underwent stenting only. Patients in the RFA group survived a median of 311 days, while the stent only arm exhibited a median survival of 172 (P = 0.012).83 It is hypothesized that the pathophysiology behind increased survivability with RFA lies in the inflammatory response it induces within the neoplastic tissue.84 While RFA may only achieve necrosis of 10% of the total malignant lesion, this limited area of cell death releases tumor antigens with subsequent development of local inflammation. CD8+ T cells are then activated. Heat shock protein 70 transports antigenic peptides to antigen-presenting cells, which stimulate a tumor-specific immune response. This leads to eradication of tumor cells and thus, limits micro-metastasis.84 While neither study evaluated EUS-RFA in pancreatic cancer, one may surmise a similar immune reaction may be induced in pancreatic adenocarcinoma with RFA, but further trials are needed. ERCP is the first-line intervention for palliation of biliary obstruction secondary to pancreatic malignancy, as it is minimally invasive with symptom resolution in up to 95% of patients.4,13,85–87 The subset of cases not achieving technical success in accessing the papilla are primarily due to anatomical variation, ampullary pathology, or malignant duodenal or biliary obstruction.85,86 Traditionally, patients failing biliary drainage via ERCP were managed with percutaneous transhepatic biliary drainage (PTBD) or a surgical approach. 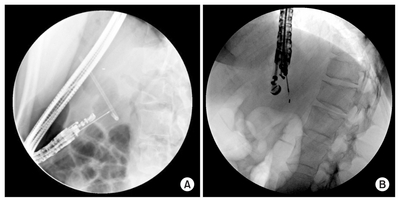 Both procedures are associated with serious potential complications; their use of external drainage also leads to a less-desired outcome for patients.85–87 A unique aspect of EUS guided biliary drainage (EGBD) is it can be performed immediately following failed ERCP.88 Wiersema et al89 first described EUS-guided cholangiopancreatography in 1996, leading to a multitude of case studies establishing EGBD as a safe, successful, and minimally invasive technique for failed transpapillary biliary cannulation. One key RCT from Artifon et al90 revealed 100% technical success rate in both transluminal EGBD and PTBD arms with no significant difference in complication rates. EUS with FNA remains an exceedingly accurate method in diagnosing and staging pancreatic cancer. However, this accuracy is limited in certain cases, such as chronic pancreatitis. Innovative methods such as contrast-enhanced EUS, EUS with elastography, and confocal endomicroscopy may overcome this limitation to further improve early detection of pancreatic malignancy. EUS-FNB may serve to increase accurate diagnoses of neoplasms requiring histopathologic confirmation. A multitude of therapeutic techniques to manage cancer of the pancreas may not only improve this population’s quality of life, such as with pain control via EUS-CGN and management of malignant obstruction via EUS-guided anastomosis or biliary drainage, but also may increase survival. EUS-guided fiducial placement and anti-tumor injection therapy provide alternative treatments for those patients failing other modalities. While data on the efficacy of EUS-RFA is limited, this emerging technique may ultimately lead to a new algorithm in treating inoperable pancreatic adenocarcinoma. Fig. 1. Endoscopic ultrasound image of sonoelastography showing a malignant perihepatic lesion in blue (images courtesy of Pentax Medical). Fig. 3. (A) Endoscopic ultrasound-guided Tru-Cut biopsy needle. (B) H&E stain of a pancreatic gland showing large malignant cells. (C) Newer generation Procore™ needle (Cook Medical). Fig. 5. (A) Schematic of endoscopic ultrasound (EUS)-guided radiofrequency ablation (RFA). (B) Fluoroscopy image of EUS-guided RFA. 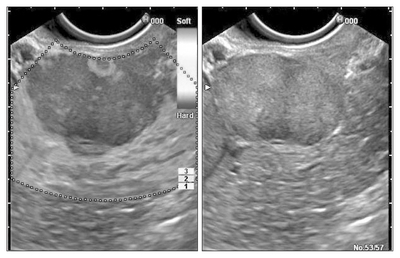 (C) EUS image of EUS-guided RFA of a neuroendocrine tumor (images courtesy of EMcision). Dimagno, EP, Regan, PT, Clain, JE, James, EM, and Buxton, JL (1982). Human endoscopic ultrasonography. Gastroenterology. 83, 824-9. DiMagno, EP, and DiMagno, MJ (2016). Endoscopic ultrasonography: from the origins to routine EUS. Dig Dis Sci. 61, 342-53. Teshima, CW, and Sandha, GS (2014). Endoscopic ultrasound in the diagnosis and treatment of pancreatic disease. World J Gastroenterol. 20, 9976-89. Oh, SY, Irani, S, and Kozarek, RA (2016). What are the current and potential future roles for endoscopic ultrasound in the treatment of pancreatic cancer?. World J Gastrointest Endosc. 8, 319-29. Luthra, AK, and Evans, JA (2016). Review of current and evolving clinical indications for endoscopic ultrasound. World J Gastrointest Endosc. 8, 157-64. Luz, LP, Al-Haddad, MA, Sey, MS, and DeWitt, JM (2014). Applications of endoscopic ultrasound in pancreatic cancer. World J Gastroenterol. 20, 7808-18. Reddy, NK, Ioncică, AM, Săftoiu, A, Vilmann, P, and Bhutani, MS (2011). Contrast-enhanced endoscopic ultrasonography. World J Gastroenterol. 17, 42-8. Dietrich, CF, Ignee, A, Braden, B, Barreiros, AP, Ott, M, and Hocke, M (2008). Improved differentiation of pancreatic tumors using contrast-enhanced endoscopic ultrasound. Clin Gastroenterol Hepatol. 6, 590-7.e1. Yip, HC, Teoh, AY, Chong, CC, and Lau, JY (2014). Current status and future applications of contrast-enhanced endoscopic ultrasonography. World J Gastrointest Endosc. 6, 121-7. Puri, R, Manrai, M, Thandassery, RB, and Alfadda, AA (2016). Endoscopic ultrasound in the diagnosis and management of carcinoma pancreas. World J Gastrointest Endosc. 8, 67-76. Kamata, K, Kitano, M, Omoto, S, Kadosaka, K, Miyata, T, and Minaga, K (2016). New endoscopic ultrasonography techniques for pancreaticobiliary diseases. Ultrasonography. 35, 169-79. Napoleon, B, Alvarez-Sanchez, MV, Gincoul, R, Pujol, B, Lefort, C, and Lepilliez, V (2010). Contrast-enhanced harmonic endoscopic ultrasound in solid lesions of the pancreas: results of a pilot study. Endoscopy. 42, 564-70. Gong, TT, Hu, DM, and Zhu, Q (2012). Contrast-enhanced EUS for differential diagnosis of pancreatic mass lesions: a meta-analysis. Gastrointest Endosc. 76, 301-9. Serrani, M, Lisotti, A, Caletti, G, and Fusaroli, P (2016). Contrast enhancement and elastography in endoscopic ultrasound: an update of clinical applications in pancreatic diseases. Minerva Med. 107, 217-22. Fusaroli, P, Napoleon, B, Gincul, R, Lefort, C, Palazzo, L, and Palazzo, M (2016). The clinical impact of ultrasound contrast agents in EUS: a systematic review according to the levels of evidence. Gastrointest Endosc. 84, 587-96.e10. Fusaroli, P, Spada, A, Mancino, MG, and Caletti, G (2010). Contrast harmonic echo-endoscopic ultrasound improves accuracy in diagnosis of solid pancreatic masses. Clin Gastroenterol Hepatol. 8, 629-34.e1–2. Kitano, M, Kamata, K, Imai, H, Miyata, T, Yasukawa, S, and Yanagisawa, A (2015). Contrast-enhanced harmonic endoscopic ultrasonography for pancreatobiliary diseases. Dig Endosc. 27, 60-7. Park, JS, Kim, HK, Bang, BW, Kim, SG, Jeong, S, and Lee, DH (2014). Effectiveness of contrast-enhanced harmonic endoscopic ultrasound for the evaluation of solid pancreatic masses. World J Gastroenterol. 20, 518-24. Kitano, M, Kudo, M, Yamao, K, Takagi, T, Sakamoto, H, and Komaki, T (2012). Characterization of small solid tumors in the pancreas: the value of contrast-enhanced harmonic endoscopic ultrasonography. Am J Gastroenterol. 107, 303-10. Singh, H, and Siddiqui, AA (2015). Endosonographic workup and preoperative biliary drainage for pancreatic cancer. Semin Oncol. 42, 59-69. Sugimoto, M, Takagi, T, Hikichi, T, Suzuki, R, Watanabe, K, and Nakamura, J (2015). Conventional versus contrast-enhanced harmonic endoscopic ultrasonography-guided fine-needle aspiration for diagnosis of solid pancreatic lesions: a prospective randomized trial. Pancreatology. 15, 538-41. DeWitt, J, McGreevy, K, Sherman, S, and LeBlanc, J (2008). Utility of a repeated EUS at a tertiary-referral center. Gastrointest Endosc. 67, 610-9. Sakamoto, H, Kitano, M, Kamata, K, El-Masry, M, and Kudo, M (2010). Diagnosis of pancreatic tumors by endoscopic ultrasonography. World J Radiol. 2, 122-34. Kongkam, P, Lakananurak, N, Navicharern, P, Chantarojanasiri, T, Aye, K, and Ridtitid, W (2015). Combination of EUS-FNA and elastography (strain ratio) to exclude malignant solid pancreatic lesions: a prospective single-blinded study. J Gastroenterol Hepatol. 30, 1683-9. Iglesias-Garcia, J, Larino-Noia, J, Abdulkader, I, Forteza, J, and Dominguez-Munoz, JE (2010). Quantitative endoscopic ultrasound elastography: an accurate method for the differentiation of solid pancreatic masses. Gastroenterology. 139, 1172-80. Opačić, D, Rustemović, N, Kalauz, M, Markoš, P, Ostojić, Z, and Majerović, M (2015). Endoscopic ultrasound elastography strain histograms in the evaluation of patients with pancreatic masses. World J Gastroenterol. 21, 4014-9. Pei, Q, Zou, X, Zhang, X, Chen, M, Guo, Y, and Luo, H (2012). Diagnostic value of EUS elastography in differentiation of benign and malignant solid pancreatic masses: a meta-analysis. Pancreatology. 12, 402-8. Li, X, Xu, W, Shi, J, Lin, Y, and Zeng, X (2013). Endoscopic ultrasound elastography for differentiating between pancreatic adenocarcinoma and inflammatory masses: a meta-analysis. World J Gastroenterol. 19, 6284-91. Săftoiu, A (2011). State-of-the-art imaging techniques in endoscopic ultrasound. World J Gastroenterol. 17, 691-6. ASGE Technology Committee (2014). Confocal laser endomicroscopy. Gastrointest Endosc. 80, 928-38. Xu, MM, and Sethi, A (2016). Imaging of the Pancreas. Gastroenterol Clin North Am. 45, 101-16. Meining, A (2009). Confocal endomicroscopy. Gastrointest Endosc Clin N Am. 19, 629-35. Fugazza, A, Gaiani, F, Carra, MC, Brunetti, F, Lévy, M, and Sobhani, I (2016). Confocal laser endomicroscopy in gastrointestinal and pancreatobiliary diseases: a systematic review and meta-analysis. Biomed Res Int. 2016, 4638683. Bhutani, MS, Koduru, P, Joshi, V, Karstensen, JG, Saftoiu, A, and Vilmann, P (2015). EUS-guided needle-based confocal laser endomicroscopy: a novel technique with emerging applications. Gastroenterol Hepatol (N Y). 11, 235-40. Kiesslich, R, Burg, J, Vieth, M, Gnaendiger, J, Enders, M, and Delaney, P (2004). Confocal laser endoscopy for diagnosing intraepithelial neoplasias and colorectal cancer in vivo. Gastroenterology. 127, 706-13. Buchner, AM, and Wallace, MB (2015). In-vivo microscopy in the diagnosis of intestinal neoplasia and inflammatory conditions. Histopathology. 66, 137-46. Samarasena, JB, Nakai, Y, and Chang, KJ (2012). Endoscopic ultrasonography-guided fine-needle aspiration of pancreatic cystic lesions: a practical approach to diagnosis and management. Gastrointest Endosc Clin N Am. 22, Array-85. Kahaleh, M, Turner, BG, Bezak, K, Sharaiha, RZ, Sarkaria, S, and Lieberman, M (2015). Probe-based confocal laser endomicroscopy in the pancreatic duct provides direct visualization of ductal structures and aids in clinical management. Dig Liver Dis. 47, 202-4. Meining, A, Frimberger, E, Becker, V, Von Delius, S, Von Weyhern, CH, and Schmid, RM (2008). Detection of cholangiocarcinoma in vivo using miniprobe-based confocal fluorescence microscopy. Clin Gastroenterol Hepatol. 6, 1057-60. Almadi, MA, and Neumann, H (2015). Probe based confocal laser endomicroscopy of the pancreatobiliary system. World J Gastroenterol. 21, 12696-708. Konda, VJ, Aslanian, HR, Wallace, MB, Siddiqui, UD, Hart, J, and Waxman, I (2011). First assessment of needle-based confocal laser endomicroscopy during EUS-FNA procedures of the pancreas (with videos). Gastrointest Endosc. 74, 1049-60. Konda, VJ, Meining, A, Jamil, LH, Giovannini, M, Hwang, JH, and Wallace, MB (2013). A pilot study of in vivo identification of pancreatic cystic neoplasms with needle-based confocal laser endomicroscopy under endosonographic guidance. Endoscopy. 45, 1006-13. Napoléon, B, Lemaistre, AI, Pujol, B, Caillol, F, Lucidarme, D, and Bourdariat, R (2015). A novel approach to the diagnosis of pancreatic serous cystadenoma: needle-based confocal laser endomicroscopy. Endoscopy. 47, 26-32. Iwashita, T, Nakai, Y, Samarasena, JB, Park, DH, Zhang, Z, and Gu, M (2013). High single-pass diagnostic yield of a new 25-gauge core biopsy needle for EUS-guided FNA biopsy in solid pancreatic lesions. Gastrointest Endosc. 77, 909-15. De Lisi, S, and Giovannini, M (2016). Endoscopic ultrasonography: transition towards the future of gastro-intestinal diseases. World J Gastroenterol. 22, 1779-86. Bang, JY, Hebert-Magee, S, Trevino, J, Ramesh, J, and Varadarajulu, S (2012). Randomized trial comparing the 22-gauge aspiration and 22-gauge biopsy needles for EUS-guided sampling of solid pancreatic mass lesions. Gastrointest Endosc. 76, 321-7. Hewitt, MJ, McPhail, MJ, Possamai, L, Dhar, A, Vlavianos, P, and Monahan, KJ (2012). EUS-guided FNA for diagnosis of solid pancreatic neoplasms: a meta-analysis. Gastrointest Endosc. 75, 319-31. Adler, DG, Jacobson, BC, Davila, RE, Hirota, WK, Leighton, JA, and Qureshi, WA (2005). ASGE guideline: complications of EUS. Gastrointest Endosc. 61, 8-12. Yang, Y, Li, L, Qu, C, Liang, S, Zeng, B, and Luo, Z (2016). Endoscopic ultrasound-guided fine needle core biopsy for the diagnosis of pancreatic malignant lesions: a systematic review and meta-analysis. Sci Rep. 6, 22978. Paik, WH, Park, Y, Park, DH, Hong, SM, Lee, BU, and Choi, JH (2015). Prospective evaluation of new 22 gauge endoscopic ultrasound core needle using capillary sampling with stylet slow-pull technique for intra-abdominal solid masses. J Clin Gastroenterol. 49, 199-205. Park, SW, Chung, MJ, Lee, SH, Lee, HS, Lee, HJ, and Park, JY (2016). Prospective study for comparison of endoscopic ultrasound-guided tissue acquisition using 25- and 22-gauge core biopsy needles in solid pancreatic masses. PLoS One. 11, e0154401. Levy, MJ, Jondal, ML, Clain, J, and Wiersema, MJ (2003). Preliminary experience with an EUS-guided trucut biopsy needle compared with EUS-guided FNA. Gastrointest Endosc. 57, 101-6. Varadarajulu, S, Fraig, M, Schmulewitz, N, Roberts, S, Wildi, S, and Hawes, RH (2004). Comparison of EUS-guided 19-gauge Trucut needle biopsy with EUS-guided fine-needle aspiration. Endoscopy. 36, 397-401. Wittmann, J, Kocjan, G, Sgouros, SN, Deheragoda, M, and Pereira, SP (2006). Endoscopic ultrasound-guided tissue sampling by combined fine needle aspiration and trucut needle biopsy: a prospective study. Cytopathology. 17, 27-33. Berzosa, M, Villa, N, El-Serag, HB, Sejpal, DV, and Patel, KK (2015). Comparison of endoscopic ultrasound guided 22-gauge core needle with standard 25-gauge fine-needle aspiration for diagnosing solid pancreatic lesions. Endosc Ultrasound. 4, 28-33. Adler, DG, Witt, B, Chadwick, B, Wells, J, Taylor, LJ, and Dimaio, C (2016). Pathologic evaluation of a new endoscopic ultrasound needle designed to obtain core tissue samples: a pilot study. Endosc Ultrasound. 5, 178-83. Kandel, P, Tranesh, G, Nassar, A, Bingham, R, Raimondo, M, and Woodward, TA (2016). EUS-guided fine needle biopsy sampling using a novel fork-tip needle: a case-control study. Gastrointest Endosc. 84, 1034-9. Chang, BW, and Saif, MW (2008). Stereotactic body radiation therapy (SBRT) in pancreatic cancer: is it ready for prime time?. JOP. 9, 676-82. Pishvaian, AC, Collins, B, Gagnon, G, Ahlawat, S, and Haddad, NG (2006). EUS-guided fiducial placement for CyberKnife radiotherapy of mediastinal and abdominal malignancies. Gastrointest Endosc. 64, 412-7. Park, WG, Yan, BM, Schellenberg, D, Kim, J, Chang, DT, and Koong, A (2010). EUS-guided gold fiducial insertion for image-guided radiation therapy of pancreatic cancer: 50 successful cases without fluoroscopy. Gastrointest Endosc. 71, 513-8. Sanders, MK, Moser, AJ, Khalid, A, Fasanella, KE, Zeh, HJ, and Burton, S (2010). EUS-guided fiducial placement for stereotactic body radiotherapy in locally advanced and recurrent pancreatic cancer. Gastrointest Endosc. 71, 1178-84. Dávila Fajardo, R, Lekkerkerker, SJ, van der Horst, A, Lens, E, Bergman, JJ, and Fockens, P (2014). EUS-guided fiducial markers placement with a 22-gauge needle for image-guided radiation therapy in pancreatic cancer. Gastrointest Endosc. 79, 851-5. Dhadham, GC, Hoffe, S, Harris, CL, and Klapman, JB (2016). Endoscopic ultrasound-guided fiducial marker placement for image-guided radiation therapy without fluoroscopy: safety and technical feasibility. Endosc Int Open. 4, E378-82. Seo, DW (2010). EUS-guided antitumor therapy for pancreatic tumors. Gut Liver. 4, S76-81. Kaplan, J, Khalid, A, Cosgrove, N, Soomro, A, Mazhar, SM, and Siddiqui, AA (2015). Endoscopic ultrasound-fine needle injection for oncological therapy. World J Gastrointest Oncol. 7, 466-72. Chang, KJ, Nguyen, PT, Thompson, JA, Kurosaki, TT, Casey, LR, and Leung, EC (2000). Phase I clinical trial of allogeneic mixed lymphocyte culture (cytoimplant) delivered by endoscopic ultrasound-guided fine-needle injection in patients with advanced pancreatic carcinoma. Cancer. 88, 1325-35. Bhutani, MS (2003). Endoscopic ultrasound guided antitumor therapy. Endoscopy. 35, S54-6. Irisawa, A, Takagi, T, Kanazawa, M, Ogata, T, Sato, Y, and Takenoshita, S (2007). Endoscopic ultrasound-guided fine-needle injection of immature dendritic cells into advanced pancreatic cancer refractory to gemcitabine: a pilot study. Pancreas. 35, 189-90. Hirooka, Y, Itoh, A, Kawashima, H, Hara, K, Nonogaki, K, and Kasugai, T (2009). A combination therapy of gemcitabine with immunotherapy for patients with inoperable locally advanced pancreatic cancer. Pancreas. 38, 69-74. Endo, H, Saito, T, Kenjo, A, Hoshino, M, Terashima, M, and Sato, T (2012). Phase I trial of preoperative intratumoral injection of immature dendritic cells and OK-432 for resectable pancreatic cancer patients. J Hepatobiliary Pancreat Sci. 19, 465-75. Hecht, JR, Bedford, R, Abbruzzese, JL, Lahoti, S, Reid, TR, and Soetikno, RM (2003). A phase I/II trial of intratumoral endoscopic ultrasound injection of ONYX-015 with intravenous gemcitabine in unresectable pancreatic carcinoma. Clin Cancer Res. 9, 555-61. Cherubini, G, Kallin, C, Mozetic, A, Hammaren-Busch, K, Müller, H, and Lemoine, NR (2011). The oncolytic adenovirus AdΔΔ enhances selective cancer cell killing in combination with DNA-damaging drugs in pancreatic cancer models. Gene Ther. 18, 1157-65. Hecht, JR, Farrell, JJ, Senzer, N, Nemunaitis, J, Rosemurgy, A, and Chung, T (2012). EUS or percutaneously guided intratumoral TNFerade biologic with 5-fluorouracil and radiotherapy for first-line treatment of locally advanced pancreatic cancer: a phase I/II study. Gastrointest Endosc. 75, 332-8. Herman, JM, Wild, AT, Wang, H, Tran, PT, Chang, KJ, and Taylor, GE (2013). Randomized phase III multi-institutional study of TNFerade biologic with fluorouracil and radiotherapy for locally advanced pancreatic cancer: final results. J Clin Oncol. 31, 886-94. Hanna, N, Ohana, P, Konikoff, FM, Leichtmann, G, Hubert, A, and Appelbaum, L (2012). Phase 1/2a, dose-escalation, safety, pharmacokinetic and preliminary efficacy study of intratumoral administration of BC-819 in patients with unresectable pancreatic cancer. Cancer Gene Ther. 19, 374-81. Figueroa-Barojas, P, Bakhru, MR, Habib, NA, Ellen, K, Millman, J, and Jamal-Kabani, A (2013). Safety and efficacy of radiofrequency ablation in the management of unresectable bile duct and pancreatic cancer: a novel palliation technique. J Oncol. 2013, 910897. Khorsandi, SE, Zacharoulis, D, Vavra, P, Navarra, G, Kysela, P, and Habib, N (2008). The modern use of radiofrequency energy in surgery, endoscopy, and interventional radiology. Eur Surg. 40, 204. Steel, AW, Postgate, AJ, Khorsandi, S, Nicholls, J, Jiao, L, and Vlavianos, P (2011). Endoscopically applied radiofrequency ablation appears to be safe in the treatment of malignant biliary obstruction. Gastrointest Endosc. 73, 149-53. Pai, M, Habib, N, Senturk, H, Lakhtakia, S, Reddy, N, and Cicinnati, VR (2015). Endoscopic ultrasound guided radiofrequency ablation, for pancreatic cystic neoplasms and neuroendocrine tumors. World J Gastrointest Surg. 7, 52-9. Pai, M, Yang, J, Zhang, X, Jin, Z, Wang, D, and Senturk, H (2013). Endoscopic ultrasound guided radiofrequency ablation (EUS-RFA) for pancreatic ductal adenocarcinoma. Gut. 62, A153. Kallis, Y, Phillips, N, Steel, A, Kaltsidis, H, Vlavianos, P, and Habib, N (2015). Analysis of endoscopic radiofrequency ablation of biliary malignant strictures in pancreatic cancer suggests potential survival benefit. Dig Dis Sci. 60, 3449-55. Hu, B, Gao, D, Zhang, X, and Zhang, Y (2016). 121 endobiliary radiofrequency ablation improve overall survival of Cholangiocarcinoma: a multi-center randomized control study. Gastrointest Endosc. 83, AB126. Kahaleh, M, Artifon, EL, Perez-Miranda, M, Gaidhane, M, Rondon, C, and Itoi, T (2015). Endoscopic ultrasonography guided drainage: summary of consortium meeting, May 21, 2012, San Diego, California. World J Gastroenterol. 21, 726-41. Sarkaria, S, Lee, HS, Gaidhane, M, and Kahaleh, M (2013). Advances in endoscopic ultrasound-guided biliary drainage: a comprehensive review. Gut Liver. 7, 129-36. Savides, TJ, Varadarajulu, S, Palazzo, L, and EUS 2008 Working Group (2009). EUS 2008 working group document: evaluation of EUS-guided hepaticogastrostomy. Gastrointest Endosc. 69, S3-7. Fabbri, C, Luigiano, C, Lisotti, A, Cennamo, V, Virgilio, C, and Caletti, G (2014). Endoscopic ultrasound-guided treatments: are we getting evidence based--a systematic review. World J Gastroenterol. 20, 8424-48. Wiersema, MJ, Sandusky, D, Carr, R, Wiersema, LM, Erdel, WC, and Frederick, PK (1996). Endosonography-guided cholangiopancreatography. Gastrointest Endosc. 43, 102-6. Artifon, EL, Aparicio, D, Paione, JB, Lo, SK, Bordini, A, and Rabello, C (2012). Biliary drainage in patients with unresectable, malignant obstruction where ERCP fails: endoscopic ultrasonography-guided choledochoduodenostomy versus percutaneous drainage. J Clin Gastroenterol. 46, 768-74. Khashab, MA, Valeshabad, AK, Modayil, R, Widmer, J, Saxena, P, and Idrees, M (2013). EUS-guided biliary drainage by using a standardized approach for malignant biliary obstruction: rendezvous versus direct transluminal techniques (with videos). Gastrointest Endosc. 78, 734-41. Khashab, MA, Valeshabad, AK, Afghani, E, Singh, VK, Kumbhari, V, and Messallam, A (2015). A comparative evaluation of EUS-guided biliary drainage and percutaneous drainage in patients with distal malignant biliary obstruction and failed ERCP. Dig Dis Sci. 60, 557-65. Gupta, K, Perez-Miranda, M, Kahaleh, M, Artifon, EL, Itoi, T, and Freeman, ML (2014). Endoscopic ultrasound-assisted bile duct access and drainage: multicenter, long-term analysis of approach, outcomes, and complications of a technique in evolution. J Clin Gastroenterol. 48, 80-7. Siddiqui, A, Spechler, SJ, and Huerta, S (2007). Surgical bypass versus endoscopic stenting for malignant gastroduodenal obstruction: a decision analysis. Dig Dis Sci. 52, 276-81. Chen, YI, and Khashab, MA (2016). Endoscopic approach to gastrointestinal bypass in malignant gastric outlet obstruction. Curr Opin Gastroenterol. 32, 365-73. Chopita, N, Vaillaverde, A, Cope, C, Bernedo, A, Martinez, H, and Landoni, N (2005). Endoscopic gastroenteric anastomosis using magnets. Endoscopy. 37, 313-7.
van Hooft, JE, Vleggaar, FP, Le Moine, O, Bizzotto, A, Voermans, RP, and Costamagna, G (2010). Endoscopic magnetic gastroenteric anastomosis for palliation of malignant gastric outlet obstruction: a prospective multicenter study. Gastrointest Endosc. 72, 530-5. Khashab, MA, Kumbhari, V, Grimm, IS, Ngamruengphong, S, Aguila, G, and El Zein, M (2015). EUS-guided gastroenterostomy: the first U.S. clinical experience (with video). Gastrointest Endosc. 82, 932-8. Tyberg, A, Kumta, N, Karia, K, Zerbo, S, Sharaiha, RZ, and Kahaleh, M (2015). EUS-guided gastrojejunostomy after failed enteral stenting. Gastrointest Endosc. 81, 1011-2. Itoi, T, Tsuchiya, T, Tonozuka, R, Ijima, M, and Kusano, C (2016). Novel EUS-guided double-balloon-occluded gastrojejunostomy bypass. Gastrointest Endosc. 83, 461-2. Tyberg, A, Perez-Miranda, M, Sanchez-Ocaña, R, Peñas, I, de la Serna, C, and Shah, J (2016). Endoscopic ultrasound-guided gastrojejunostomy with a lumen-apposing metal stent: a multicenter, international experience. Endosc Int Open. 4, E276-81. Itoi, T, Ishii, K, Ikeuchi, N, Sofuni, A, Gotoda, T, and Moriyasu, F (2016). Prospective evaluation of endoscopic ultrasonography-guided double-balloon-occluded gastrojejunostomy bypass (EPASS) for malignant gastric outlet obstruction. Gut. 65, 193-5. Chen, YI, Itoi, T, Baron, TH, Nieto, J, Haito-Chavez, Y, and Grimm, IS (2016). EUS-guided gastroenterostomy is comparable to enteral stenting with fewer re-interventions in malignant gastric outlet obstruction. Surg Endosc. Wiersema, MJ, and Wiersema, LM (1996). Endosonography-guided celiac plexus neurolysis. Gastrointest Endosc. 44, 656-62. Puli, SR, Reddy, JB, Bechtold, ML, Antillon, MR, and Brugge, WR (2009). EUS-guided celiac plexus neurolysis for pain due to chronic pancreatitis or pancreatic cancer pain: a meta-analysis and systematic review. Dig Dis Sci. 54, 2330-7. Wyse, JM, Carone, M, Paquin, SC, Usatii, M, and Sahai, AV (2011). Randomized, double-blind, controlled trial of early endoscopic ultrasound-guided celiac plexus neurolysis to prevent pain progression in patients with newly diagnosed, painful, inoperable pancreatic cancer. J Clin Oncol. 29, 3541-6. Arcidiacono, PG, Calori, G, Carrara, S, McNicol, ED, and Testoni, PA (2011). Celiac plexus block for pancreatic cancer pain in adults. Cochrane Database Syst Rev, CD007519. Gleeson, FC, Levy, MJ, Papachristou, GI, Pelaez-Luna, M, Rajan, E, and Clain, JE (2007). Frequency of visualization of presumed celiac ganglia by endoscopic ultrasound. Endoscopy. 39, 620-4. Levy, MJ, Topazian, MD, Wiersema, MJ, Clain, JE, Rajan, E, and Wang, KK (2008). Initial evaluation of the efficacy and safety of endoscopic ultrasound-guided direct Ganglia neurolysis and block. Am J Gastroenterol. 103, 98-103. Doi, S, Yasuda, I, Kawakami, H, Hayashi, T, Hisai, H, and Irisawa, A (2013). Endoscopic ultrasound-guided celiac ganglia neurolysis vs. celiac plexus neurolysis: a randomized multicenter trial. Endoscopy. 45, 362-9.